Booking photo of Marilyn Hartman from a previous Bay Area arrest. Authorities at Los Angeles International Airport arrested her again Monday night, Aug. 4, 2014. 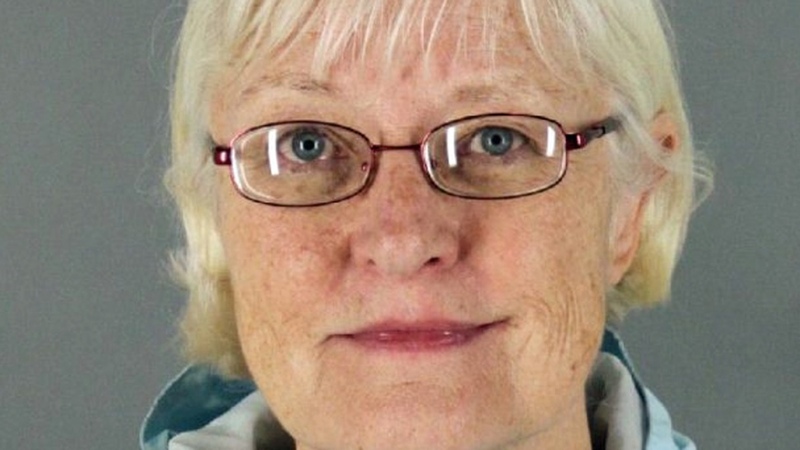 So-called “serial stowaway” Marilyn Hartman is back behind bars. Hartman was arrested Wednesday around 2:30 p.m. at O’Hare airport, when an electronic monitoring bracelet she was ordered to wear by Cook County Judge William Raines alerted authorities, multiple sources told NBC5. Hartman was placed in custody and is scheduled to appear in bond court at 9 a.m. Thursday. At a hearing earlier this month, Raines agreed to relax restrictions on Hartman’s confinement, allowing her transfer from the locked mental health facility where she had been living since last December to another facility where she would be allowed to come and go as she pleased. Sources say she was found Wednesday at a bus shuttle center at O’Hare, one of several locations she had been ordered to stay away from when her new living guidelines were outlined. The 64-year-old "serial stowaway" told NBC5 Investigates to a litany of past wrongs, as justification for repeated encounters with police at airports across America. Following a series of bizarre episodes at O’Hare and Midway airports last year, Hartman spent at least 145 days at Cook County Jail. She was later sentenced to mental health probation with a caveat that she must stay away from so-called "exclusion zones." Under those rules, Hartman was to stay away from O’Hare and Midway airports, Union Station, and the Greyhound bus facility. Her electronic ankle bracelet was programmed to alert authorities if she violated those restrictions. During the Feb. 4 hearing, Raines told those assembled it was his intention to get Hartman to a place where she could begin a migration back into the community. It was eventually agreed that Hartman would be moved to the less restrictive Sacred Heart facility, which would allow come-and-go privileges. But the judge reminded Hartman that the so-called “exclusionary zones” would remain in effect. In the meantime, Hartman said she hoped to use her newfound freedom to make frequent use of a nearby library, or perhaps take computer training courses at Truman College. Raines reminded Hartman that O’Hare and Midway personnel knew who she was, and that she faced up to a year in jail if she was caught again. Now, it appears that warning was prophetic. Hartman has tried to get past security at Chicago's O'Hare Airport numerous times, most recently in July of last year. Prior to that, starting last April, Hartman had five other encounters with airport security, four at O'Hare and one at Midway. In two of those, she received warnings and was escorted off airport property. The other three resulted in arrests. Across America, Hartman has tried repeatedly to get past security and stow away on airplanes, and it’s believed she’s succeeded at least three times. But when asked in an exclusive interview with NBC 5 late last year, Hartman suggested that number may be even higher. "It may have been eight times," Hartman said during the wide-ranging interview.